Having been crowned Asia’s best-performing stock exchange and named among the world’s top 10 highest-gaining exchanges in 2017, the Vietnamese stock market is regarded as investment-worthy to say the least. In early April, the benchmark Vietnam Stock Index (VN-Index) hit a new record of 1,200 points, surpassing its March 2007 peak of 1179.32 points. Indeed, the index saw an impressive 80 percent growth throughout 2017 and the first three months of 2018. In June 2018, market capitalisation reached $160bn. There are two million accounts on the Vietnam stock market, in which there are 30,000 accounts of foreign investors. Non-Vietnamese investors own $36bn worth of equity and bonds. This position was supported by recent state initiatives; in August 2017, the government kick-started the derivatives market in a bid to further improve the Vietnamese securities market structure, while also enhancing the quality and diversification of its products in accordance with international best practices. In mid-April, however, stocks plunged amid uncertainties surrounding global equities markets. Every major stock index in Vietnam suffered a steep drop in the second quarter of the year, with the VN-Index falling by more than 25 percent from its peak in early April. But as of mid-July, Vietnam’s stock market meltdown appears to be subsiding; there are mounting signs that the market is recovering, with good stocks resurfacing at decent prices. Indeed, with yearly earnings growth expected to range between 20 and 25 percent in the second half of 2018, Vietnam’s equities are becoming more and more attractive, particularly against the backdrop of the country’s sustained economic stability. In light of these recent developments, World Finance spoke to Tran Hai Ha, CEO of MB Securities (MBS), about the stock market in Vietnam, minimising risk and the group’s forward-thinking strategy. For over 18 years, we have always focused on the core value offered to our customers. I think it’s a key factor behind our leading market position in both the HNX and HSX. Since its establishment, MBS has been consistent in its long-term vision and strategy, which correlates with our goal of providing the best possible securities services. Honestly, this clear vision keeps MBS heading in the right direction; we know what we have to do in each period to adapt to changing market conditions and achieve our overarching goal. We are proud to have one of the strongest research teams in the country, which uses in-depth market and industry insights to provide a critical understanding of our macro-market reports and equity analyses. In the age of digital and information technology, our online trading platform is an imperative factor in driving our brokerage house towards success. Over the last three years, we have been investing heavily in our in-house IT and have launched our Contact24, Stock24, M.Stock24 and Home24 platforms. These programs provide online derivatives trading, online securities trading and online securities services, allowing our clients to securely conduct transactions anytime and anywhere. In addition, our consultancy support centre is available to assist clients in investment matters 24/7. The risks associated with the stock market cannot be entirely removed, but they can be controlled. Since day one, we have paid strong attention to developing robust risk management procedures and risk management strategies. Through these we take a structured and coherent approach to identifying, managing and minimising risks in relation to market, credit, operational, legal and liquidity risks. We conduct internal risk management policies that are based on our practical risk management and experiences, as well as our corporate governance structures and national regulation frameworks. Essentially, we carry out four steps: identification of possible risks, evaluation and measurement, reaction and governance, and, finally, a review process that ensures no further control measures are needed. We also set limits for each kind of investment in regards to the level of risk that suits our risk appetite. The limit may change from time to time depending on our performance and the asset management investment for each period. In addition, we also conduct portfolio performance reviews quarterly and have internal codes of ethics in place. FDI plays an important role in Vietnam’s economic growth. Accounting for around eight percent of GDP – which reached $221bn in 2017 – FDI increased by almost 10.8 percent to $17.5bn in this period. This positive trend continued through the first quarter of 2018. These results are the fruits of Vietnam’s commitment to establishing a business-friendly environment and providing profit-based incentives for foreign investment inflows. Such incentives include short-term corporate income tax (CIT) exemptions (which range from four to five years), a long-term special CIT rate of five to 15 percent, personal income tax exemptions for those working in a specialised business or area, free land leasing and so on. What’s more, the country continues to relax its stance on foreign ownership in many listed companies; it has lifted foreign investment capital by up to 100 percent in various sectors including banking, securities, pharmaceuticals and medical equipment. This policy amendment has been recognised as a ‘game-changer’ that could further spur investment inflows and reduce market volatility. The total transaction value reached $10.2bn in 2017 compared with 4bn in 2013, and there was CAGR of 31%. In the first eight months of 2018, there were 3,331 cases of capital contribution and state purchases from foreign investors with a total value of $4.8bn. 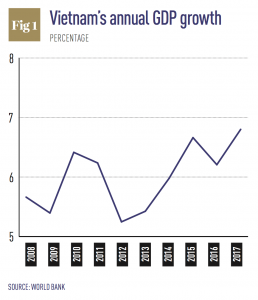 I believe Vietnam will continue to witness a boom in M&A activity over the coming years, especially given the country’s positive macroeconomic growth, rising GDP (see Fig 1), steady political climate, commitment to the development of the economy and stable currency. The marketability of the national economy is also an important factor, as is Vietnam’s open regulatory framework. 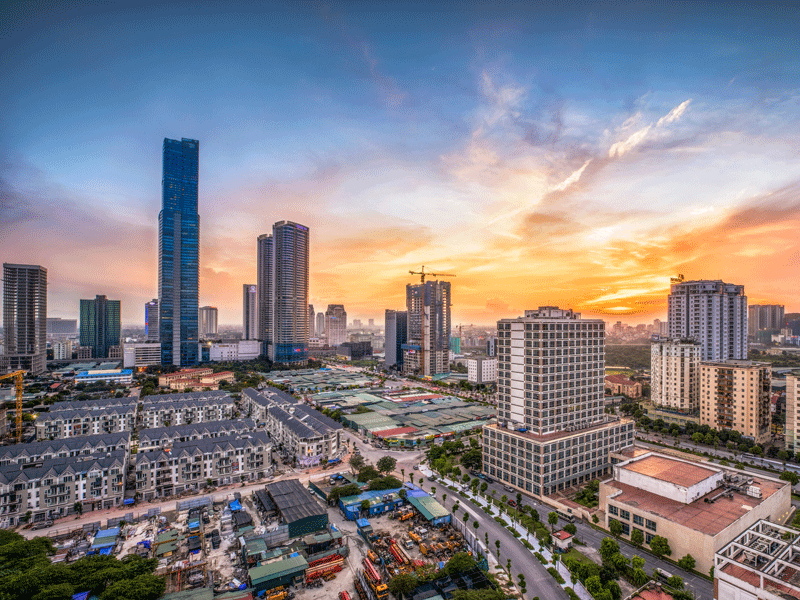 M&A investors are drawn to Vietnam as the population is approaching 100 million and has a great connection with 600 million people in the region. Recently, foreign investors from Singapore, Thailand, Korea and Japan have been involved in M&A activities across all sectors, but particularly in retail, FMCG, real estate, finance and agriculture. They have played an important role in M&A activity, creating a dynamic M&A market in Vietnam. It is predicted that the explosion in both the number and scale of M&A transactions in key economic sectors will reach a total value of some $50bn between 2018 and 2020. Naturally, the actual market value will depend on many factors, such as local and international market conditions. Being very aware of the role investment banking services play in a securities firm’s development, we pay close attention to, and invest in, services that will enable us to reach international standards. In the last three years, MBS has been listed among the country’s top five securities firms in terms of revenue from investment banking services. By the end of 2018, we aim to be in the top three. Our strengths are a perfect blend of talent, experience, market knowledge and partnerships. With 18 years of experience providing integrated investment banking services to hundreds of clients across various industries, we have not only built up a large network of corporations and financial institutions, but our staff has also gained on-the-ground knowledge of the Vietnamese business environment. We always carry out independent assessments of every transaction to evaluate a client’s proficiencies. We then create a tailored structure to ensure the success of the deal, satisfying the client’s requirements, as well as attracting investors. Furthermore, our investment banking services receive support from our brokerage (with more than 70,000 accounts), trading, stock research and analyst departments in order to offer value chains to our clients. As a subsidiary of Military Bank, we can also take advantage of the group’s financial capacity and client network. Finally, MBS is actively involved in M&A activities, with financial and M&A advisory services available to clients. Operating as a proactive local securities firm in the market, we fully understand corporate culture and have strong relationships with local corporations, as well as on-the-ground knowledge of market and legal systems to offer the best solutions to enterprises and ensure the success of their deals. I strongly believe that local securities firms have a strong competitive advantage in M&A advisory services in Vietnam, including cross-border deals. Well, our strategy has been developing in relation to the development of Vietnam’s stock market. It is predicted that the economy will be upgraded from a frontier market to an emerging market in 2020 by MSCI. This will boost the confidence of both domestic and foreign investors, while attracting capital inflows to the local market. We always strive to improve the quality of our services and reach international standards in order to enhance our client and institutional network. Moreover, we continue to focus on our core business, on maintaining sustainable growth in brokerage and investment banking, and on achieving our goal of being listed in the top three securities firms in terms of both market share and revenue.